Clearly, Paul Yoo’s words have sunk in. Chloe Obico, Marketing Specialist for This Bar Saves Lives, and I are having a conversation at eight in the evening. With a growing team of just over fifteen people and a global brand that’s recently added domestic giving in the US, there is a lot to be done. 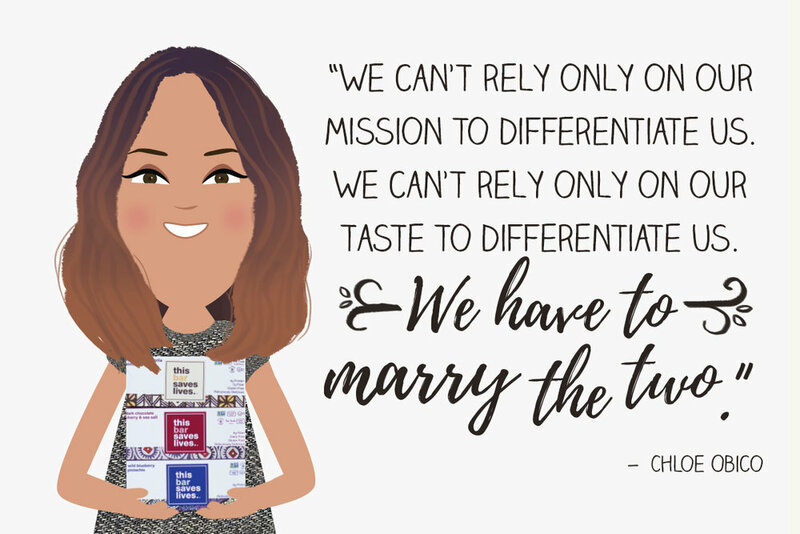 Luckily, Chloe describes her team as one that’s always helping each other out and stepping up when they need to, even when it’s outside their comfort zone or expertise. Plus, having actors without business backgrounds as founders seems to have instilled a sense of making it happen and being willing to learn into the company culture. I talked with Chloe about the current landscape of social enterprises, the responsible practices of This Bar Saves Lives, and how she’s grown as a professional while working in a mission-driven company. Is this kinder marketing strategy a better fit for your business? My obsession with kindness started with a sand mandala. I had seen a flyer at my local library branch for an event where a bunch of monks were visiting to construct one, so on a Saturday morning, I got into my car and drove over to see what it was all about. I remember the cliche calm I felt as I walked into that room and witnessed monks on their hands and knees carefully arranging the grains of sand. The design was intricate and vibrant, and I remember thinking what a pity it was that in a few short hours, it would be purposely blown away. In 2016, Cyber Monday alone broke their sales record with $3.45 billion in sales. Black Friday, in comparison, clocked in at $655.8 billion with about 1k spent per shopper. In short, if you’ve got something to sell, the long weekend after Thanksgiving is a critical time to do it. If you’re a social enterprise, though, you’re interested in more than just profits. You’re interested in giving back, too. #GivingTuesday, created by 92Y, a cultural center in NYC, falls on the first Tuesday after Thanksgiving and uses social media and collaboration to engage in small acts of kindness through the donation of time, services, and money. The movement has grown significantly since its inception in 2012 and raised $177 million online in 2016 alone. If you want to participate but are at a loss for how your small business can give back on #GivingTuesday, here are 7 creative examples. I’m sitting in a room with just over 100 women, and we’re all listening to someone speak about marketing. He’s talking to us about social media and how Facebook is now “pay to play”. With each slide, he stresses the importance of us being on social and establishing a relationship with our ideal client well before she intends on purchasing. I look around and see somen women jotting down notes. One raises her hand at the end to ask where she can get in touch with him for coaching. Throughout the presentation, I’m nodding because I agree with what he says. He’s right, we should be building relationships prior to the sale, and many of us absolutely do need an ad strategy in place. It’s around that time of the year where I start doing some serious holiday shopping for my clients, the contractors I work with, and my closest online business friends. I started looking at all of my favorite socially conscious brands to start the gift buying process and realized it might be fun for me to share them with you. That way, you can give your clients and team members gifts that delight them and make a positive impact. When I’m not furiously typing out another promotion plan for a client, I run another business called The Iceberg Project. It's all about helping people who are obsessed with Italy learn Italian in a way that’s accessible and fun.One of the ways I do that is by sharing strategies of how to learn a language. And one offering that accomplished this is called the Italian Language Studio, a six-week online program that walks students through important principles like how to improve memory, how to practice thinking in Italian, and how to choose the best resources for your level. Ouch. Ouch. Ouch. That’s just a small sliver of how the rejection I had just experienced felt. While I won’t get into all of the details of the rejection at hand, I will say that at the end of it, I felt pretty unattractive, like all of my sexual appeal had just become flattened under a semi truck blasting down the highway that was my confidence. I felt my mood rapidly begin to deteriorate as my subconscious looked for a way to get revenge while also dealing with this overwhelm of emotion. Every time I‘ve made noticeable progress in my business, it’s been because I changed the way I was thinking about business. It’s been a long journey so far, and I know I’ll continue to make shifts in order to reach even higher levels. That’s why I want to say thank you to those who have helped me make those changes. Each person has been a mentor to me whether I’ve personally met them or not. In my experience, it only takes one line of dialogue from one book to completely shift the way I see things, which is such a comforting reminder to me as a writer. If just one line from any of the articles you read on my site shifts the way you’ve been thinking about your business and allows you a bit more freedom, then I feel like I’ve done my job. Running a free challenge is big right now. They started out as longer ones, around 30 days, and they’ve since scaled back to be more digestible at 5 days. But, if you’re like, “Challenges are cool, but they’re just not for me or my business,” then here are 19 alternatives to building your list by running a free challenge (with the intention, of course, of building your list).